In 1943 a first nation tracker called Alex Van Biber was hired by the United States Army to scout a possible route for the Canol pipeline supply route as part of the war effort. His expedition saw him head North across the remote wilderness of the Mckensie Mountain range to Norman Wells. He would meet a dog team heading South, shoot the horses and feed the dogs. This pipeline was built to supply oil to Alaska to defend against the Japanese that had landed on the Aleutian Islands. Alex’s expedition spent 42 days crossing the mountain range on unbroken trails by ski and snow shoes with temperatures between -50 and -60 for over 10 days of the expedition. The pipeline construction followed a different route and today this is still one of the last great wilderness areas of the world. 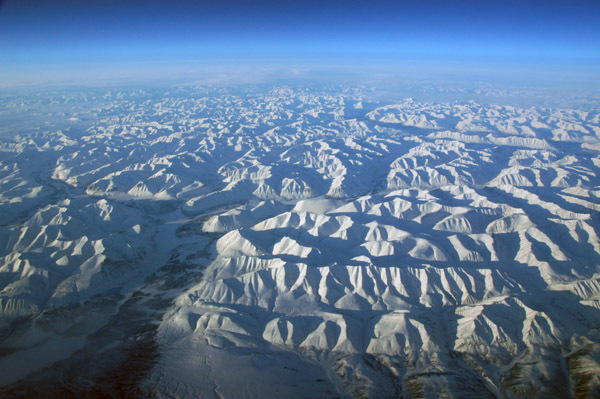 The Mckensie mountain range draws super chilled polar air and has an average winter temperature of -50. Alex is still alive at 97 and is one of Canada’s most decorated outdoorsmen. He climbed with the late Robert Kennedy and starred in the Hollywood movie The Mad Trapper. A small team will re-trace the route of Alex’s historic expedition covering as much of the orginal route as possible. They will then continue onwards to finish at the Fort Good Hope, inside the Arctic Circle. (This area has recently featured in the TV show's Ice Road Truckers). In an age where climbing Everest has become a commercial activity and there are polar races this project offers something historic and yet epic, operating at the edge of man’s limits for endurance, survival and testing the team and the kit . The ski to the Edge team are no strangers to adventure and expeditions and have completed many tough challenges before, many gaining international media attention and coverage. They have covered thousands of miles of human powered journeys between them, and are professionally qualified in a number of the required adventure skills including mountaineering, skiing and survival. The Ski to the Edge project will provide fantastic coverage and high quality media opportunities including video content, images and blogs from the expedition. The expedition lends itself well to social media updates live from the trail. The team will be raising money and awareness for several charities and causes and also provide a great cause related marketing opportunity. The Ski to the Edge Project and 500+ mile route through the Mckensie Mountain Range will push the team to the limit of their endurance for kit and physical exertion. At the average temperature ranges experienced during winter the team will consumer over 6,000 calories a day and will still lose weight. Mark Steinzig of Up North Adventures challenges us to tackle the Canoil Exploration Route of 1943 led by Alex Van Bibber. We gladly accept. Logistics and planning trip to the Yukon Territories to test kit, organize extraction plans, and interview the late Alex Van Biber. We also generated initial media interest in the story and the project. We built snow caves and tested Wall Tents in minus 25 in the Yukon with the help of Roger Palin and also Up North Adventures. The team headed out to Norway to test kit, wild camp and pull pulks near Fagerness, Norway. We tested survival skills building quinzee and snow caves in minus 15 as well as summiting various peaks pulling our former 'walking for wounded' pulks.Thanks to Lee from Vermillion Films for editing and being part of this trip. Former Royal Marine and Arctic endurance specialist Simon Reed joins the team and we completed various meetings and wilderness paddling trips in Scotland. The team are returning to Norway to test kit and hone skills before the main expedition in Jan 2018. We intend to ski and wild camp over a week in Norway. The main expedition is scheduled for Winter 2018 (Jan to March 2018) and needs to be completed before the thaw and breakup of the ice in mid to late April 2018. Melting rivers presents a significant risk to the team and the project success. It is likely to take 40-50 days to reach the Arctic Circle. The team is led by professional adventurer, Richard Harpham who has completed 22 expeditions and over 7,600 miles of human powered adventure. Richard is an inspirational speaker and story teller and a TV presenter for Visit Britain Activities. His stories have been shared, broadcast and covered by over 300 million people. Simon Reed is a former Royal Marine who has spent considerable time in hostile and challenging environments. He is no stranger to the Yukon having completed the Yukon River Quest in 2015 (5th place ) and the Yukon Arctic Ultra (2nd place). Simon is a qualified Mountain Leader and experienced arctic specialist. Matt Harpham is also an experienced adventurer and companion to Richard on a number of his adventures to Alaska and the Yukon Territories. Flint Group and Bamboo Clothing have been significant friends to the Expedition providing funding and support to move things forward. We have also had help from Canadian Affair who have assisted our travel and logistics and Yukon Tourism. Our expedition will test kit in the harshest of condition. Our current kit supporters include: MSR Snowshoes and probes, Exposure Lights, Paramo Clothing, Bamboo Clothing, Be Well Expedtion Foods, Osprey Rucksacks. The team is committed to raising awareness and funds for two great charitable causes; The Duke of Edinburgh Scheme and Alex Van Bibber Memorial Fund, both of which will provide opportunities for young people in the outdoors. On 26th January 2018 Richard Harpham, Simon Reed and Matt Harpham will depart for the Yukon to ski 600 miles unsupported from Mayo in the Yukon Territories to Norman Wells in the North West Territories braving Canada’s Arctic climate. Their route will follow the late Alex Van Bibber’s historic 1943 Canoil expedition which was part of the war effort to find a new oil supply route after the Japanese had landed on the Aleutian Islands. The original expedition led by Alex took 42 days with the team surviving on meager rations and temperatures at -40 below. The Ski to the Edge Team (Rich, Si and Matt) have spent almost a month living, exploring and traveling in the Yukon Wilderness on the Stewart River near Mayo. The original plans to follow Alex Van Bibber’s 1943 Canoil Expedition took a few twists and turns as events unfolded.